Yey! We have a new site! When I started doing the very first issue of Phygure®, I was also coding the very first version of the site at the same time. My main priority back then was to finish the “issue zero / maiden issue” so most of the work I did on that site was all rushed. It did serve its purpose by letting people check out the magazine online or thru their mobile devices, but I’m not really happy with in terms of how I developed it. Phygure® Site Ver. 2.0 now up! After 3 magazine releases, we got approved and accepted by Apple iBooks and Kobo Books store which is a huge milestone for all of us. This made the Phygure® brand somewhat “official” and my conscience is telling me our project deserves a much better site. So yeah, fast forward in time and we got ourselves a new site! The site is still in beta meaning I will still be adding/fixing a lot of stuff overtime. The important thing about this new site is I planned it carefully before I started building it making it much more easier to extend, update, and improve in the future. I know you hate tours but if you have some time to spare, check out the new features and upcoming features of the site. This section displays the most recent issue of Phygure® and it will be automatically updated once new issues are released in the future. Links to the issue’s iBooks and Kobo publication are also accessible from here. If you’re browsing on a PC, there’s also a button here that will direct you the the issue’s online magazine viewer. Previous Issues section gives you easy access to Phygure®’s previous magazine releases. All previous issues are also accessible from the homepage. Clicking one of them will direct you to its respective online magazine viewer. You can also click on the All Issues button if you want to view all of Phygure®’s released magazines. The list here will be randomly updated every time you refresh the page. All Phygure® issues are now accessible in one central location with a redesigned layout for smoother navigation. You can view all of Phygure®’s released issues by visiting the Issues page or by clicking the All Issues button from the previous issues section on the homepage. Each of the issues displayed here has their own buttons that links out to their respective iBooks and Kobo publication. You can also read all issues online via the magazine viewer by clicking the Read Now button. A dedicated page with detailed instructions and guides that will help you get featured in Phygure®. We’ve got a more streamlined and easy to access guide for individuals who wants to participate in our community-driven magazine. 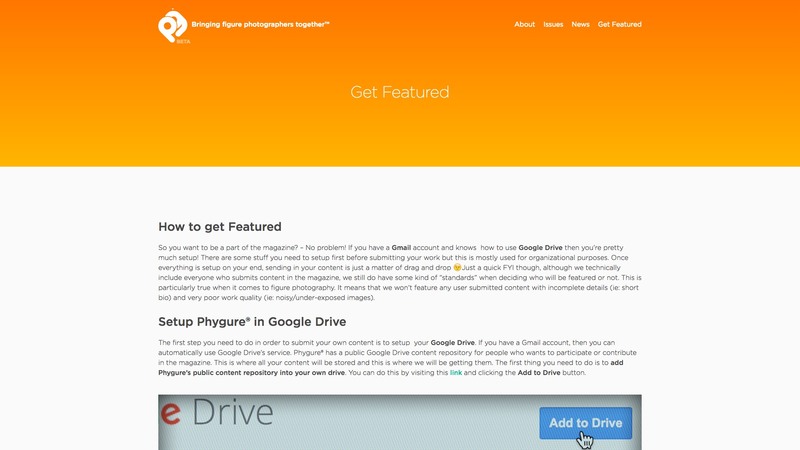 All information when it comes to submitting content for Phygure® are all detailed here. Please read through this guide as it contains very important information to make sure your work gets featured in the magazine. The guide is also updated based on Apple iBooks’ strict design and quality guidelines when publishing on their platform. The new magazine viewer is responsive and will occupy your whole screen. You can also access previously released issues without going back to the main page for a smoother reading experience. The online magazine viewer has been redesigned for a much more smoother experience. Magazine information is always visible to give you an idea of the issue you’re reading. Links to the issue’s iBooks and Kobo publication are also accessible from here in case you decided to download the magazine on your tablet devices. The page will also suggest previously released issues to avoid unnecessary back and forth between the site’s pages. The new Phygure® Site works on all standard devices. The new site will automatically adjust its layout to utilize the available screen space of your device. This is still currently being tested in different scenarios and will be updated regularly to improve the site’s responsiveness across multiple devices. In case you find some bugs or layout inconsistencies while browsing the site, just leave it in the comments section below. Figure photography is all about inspiration so we will be doing occasional written interviews with some of the best figure photographers in our community. I will be adding more subtle animation effects to improve the usability of the site. I still have a lot to add in this site so stay tuned! And since we are still in beta, you might experience some hiccups or bugs while browsing which is pretty normal. The comment’s section is open for any suggestions, improvements, and bug reports so just let me know!